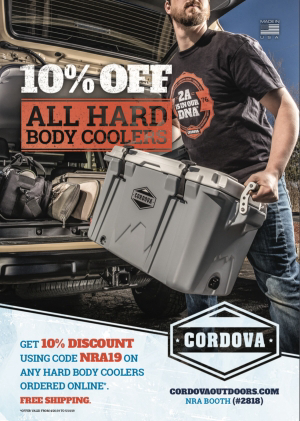 Cordova Outdoors, the leading cooler brand of outdoor enthusiasts and the officially licensed cooler of the National Rifle Association, is excited to announce a special 10% discount on all hard-side coolers purchased at the 2019 NRA Show. The 2019 NRA Annual Meetings will be held at the Indiana Convention Center in Indianapolis, IN, April 25-28. Throughout the NRA Annual Meetings in Indianapolis, all NRA members who purchase a Cordova hard-side cooler at the show will be given ten-percent off the regular purchase price. That represents a significant savings on Cordova's already competitive price for premium outdoor cold-storage solutions. Available at the show will be the NRA Official Licensed cooler, featuring the National Rifle Association acronym across the lid. The NRA licensed cooler comes in Sand, Gray, White, Aqua, Orange, and Sandstone Granite and is offered in four sizes—XSmall (5 gal,10 lbs., 15 cans) small (7 gal., 20 lbs. ice, 28 cans), medium (12 gal., 40 lbs. ice, 42 cans), large (22 gal., 70 lbs. ice, 85 cans) and XLarge (32 gal., 120 lbs. ice, 120 cans). Cordova coolers were designed by commercial fishermen to withstand the rigors of real-world outdoor adventure in the Pacific Northwest. These coolers deliver numerous practical features that address the specific needs of outdoor enthusiasts, such as a no-fall lid hinge system, a raised lid rim to keep items from sliding off, molded-in handles to prevent "cooler sway" plus machined anodized aluminum handles with integrated bottle openers, top-mount lid latches that allow access in tight places, and anti-slip goat's feet to keep the cooler in place during transport. In addition to these industry-leading features, all Cordova coolers utilize a high-efficiency insulation that "holds the cold" better than conventional cooler insulation. This denser insulation allows Cordova coolers to be built with thinner walls than other premium coolers so there is more storage capacity than competing models with similar outside dimensions. In today's crowded field of "premium" coolers, Cordova coolers stand above the rest in terms of real-world function and performance. Cordova rotomolded coolers utilize a high efficiency foam insulation that is denser than conventional cooler insulation. This means the wall thickness of Cordova coolers are thinner than other coolers, providing better cooling performance and greater interior storage capacity than coolers of similar exterior dimensions. Cordova Outdoors will display in booth #2818 at the NRA show. NRA members are encouraged to stop by the booth to see the new officially licensed cooler of the National Rifle Association and to take advantage of the special 10% discount. To learn more about Cordova rotomolded hard-side coolers, soft-side coolers, and accessories, visit cordovaoutdoors.com.